When excessive worrying gets in the way of you being able to enjoy your life, it has indeed become a problem. Here’s how to get control back. I’d like to talk to you today about what you can do if you’re getting worried that you’re worrying too much. It kind of sounds ridiculous to me as I say it but I know that people that do tend to worry, worry about everything and worrying that you’re worrying too much is definitely a big worry. 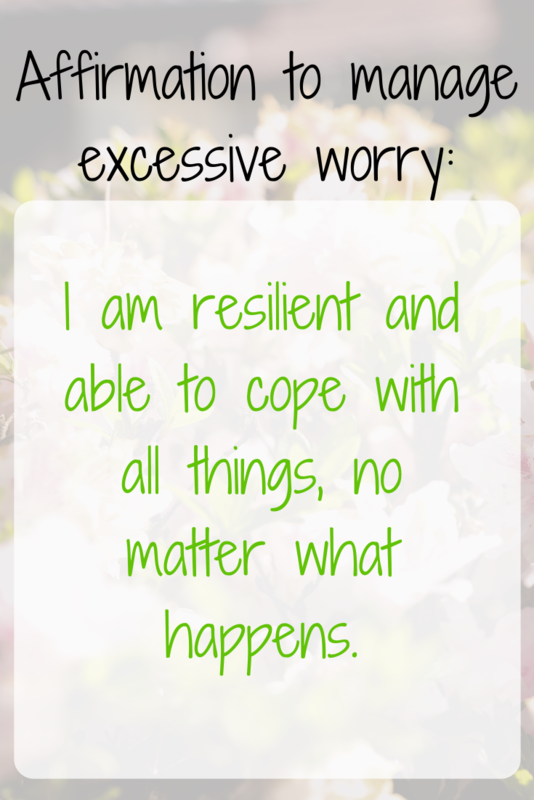 Excessive worrying is no laughing matter, it’s really not. It’s one of those things that can get really, really annoying and can be very intrusive in your life and can really take away from your ability to relax and enjoy life and live in the moment and really, that’s what worry is. Worry is trying to control what’s going to happen in the future. But there’s nothing to be gained by excessive worrying. There’s nothing that you can energetically impact by stewing on a perceived outcome that hasn’t yet happened – but I do want to say that your power is completely in the now, completely in the present. Where you are best able to affect things is where you are right now. Often the worst part is when you’re so fully engaged with it that you become the worry. You are not your thoughts and your thoughts are not you. I’ve said this before. But excessive worrying is like a super emotion-charged thought that tries to project towards the future and if too much of that happens, then you do kind of run the risk of blurring the line. Where does the worrying begin and end, and where do you begin and end? So, you need to be able to separate yourself from the worry. This isn’t about pushing it away. It’s simply separating it from yourself and allowing it to be there. So, an example would be saying: “I’m Eva and I’m worrying about whether it’s going to rain today.” So, I’m Eva and I’m thinking my thoughts but the worry is whether it’s going to rain today. Now, the more you stew on it, the more you think about it, the closer that you and your thoughts come together. So, you want to just get that separation in there because that brings space and space is where the healing happens. Often you can’t fix what you’re worrying about, but you can release it to the Universe. This brings me to my next point: space and white light. They are amazing healing tools and to bring white light around yourself really insulates you from the worry habit. Once you’ve separated yourself from the worry, imagine yourself in a bubble of white light. Picture yourself there inside the bubble, it’s completely sealed, there’s no way that anything can get in and there’s no way anything can get out but you’re just insulated and completely protected and sealed in the bubble in that moment. If you are having trouble visualizing, I have a free white light protection meditation to help you put yourself inside this white light bubble which is so nourishing and protecting and healing. To switch your energy from excessive worrying, you need to be telling yourself how resilient you are. Also tell yourself how adaptable you are and how able you are to cope with any situation and any scenario as it hits you. You probably already know this but situations are never as bad as you worry that they might be. When you’re trapped in excessive worrying, you tend to catastrophize about the future and things hardly ever turn out to be as bad as you worry they might turn out to be. Of course, when things turn out better than what you’d worried, you get that dopamine reaction which is addictive. You worry, things don’t turn out to be as bad as you thought, that feels really good. So the next time something comes up, you worry again and it’s kind of your way of getting a feel-good reaction when things do turn out well. So, what you want to do is switch off that reaction, and flip instead to telling yourself how resilient and able you are to cope with things no matter how they hit you. This allows you to be more flexible and more able to adapt and more able to cope with things no matter the outcome without the need to worry. You become more invested in the present and more able to cope in the present and more able to see that where your power is, is in the present. You become fully immersed in the ‘here and now’ and you’re better able to enjoy life and the peacefulness of the ‘here and now’ without that nagging thought in the back of your mind. I have an excellent free grounding meditation which will also help you to really anchor yourself in the ‘here and now’. It will affirm your resilience and ability to adapt in the ‘here and now’ no matter what hits you. Grounding is a fantastic way of bringing your energy together and really gaining control of it in the most gentle and peaceful way.